The SU-5-1 is a rank I Soviet tank destroyer with a battle rating of 1.3 (AB/RB/SB). It was introduced in Update 1.81 "The Valkyries". It was introduced in Update 1.67 "Assault". The SU-5-1 is a crude SPG built off the T-26 chassis. The T-26 chassis of the SU-5-1 allows it to place itself with relative ease on any spot of the map. The high gun shield can lure the enemy into firing too high, missing the crew. If a hit goes into the body, with a bit of luck, APHE ammo will not detonate on contact and instead go straight through, leaving little spalling damage. The vehicle's crew of 5 will allow some casualties before loss of efficiency. 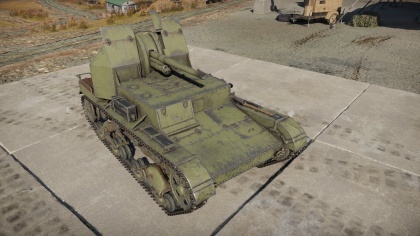 This vehicle is the perfect SPG for Russian tech tree beginners: somewhat fragile, relatively fast and a gun similar to what is found on higher ranks, it is a great trainer for later gameplay. As an open-backed SPG, the SU-5-1 should never be seen by the enemy, especially if flanked. Since the gun's ballistics are somewhat tricky and the ammo count is limited, it is recommended to ambush enemies near capture points (preferably by your team's side). As an ambusher, bring supporting fire in the rear lines of the team, never at the front but not too far, repelling enemy assaults on the point. Find a spot with a good view near a capture point or bury yourself in a dark alley and wait to see the enemy fall into your sights. Do not forget to move to the nearest captured point after each 1-2 enemy down to reload since your ammo count is that low (sometimes you won't even have enough ammo to finish the second enemy, make sure to engage only if necessary in this case). This role can be accomplished at any time in the game but it needs two things to be fulfilled: a captured objective nearby and a cooperative team. The objective will be your ammo and target supply since when waiting on a captured point you get an ammo refill. Ammo will be refilled one by one at roughly the same rate as your vehicle can shoot (about a minute for full loadout in this case). A cooperative team will help holding the point, since you can't do it all by yourself since moving means putting yourself in high risk of being spotted in a wrong position. If your team looses the point, do not rush for it (if you're not out yet...) since the enemy team may follow behind the person capturing the point. Wait for your allies to help and stay hidden, taking careful shots at well-chosen enemies. High crew count means it can afford to take a few shots, especially from tanks without HE filler or MG. Transmission in the front can absorb shots (i.e. in a sniper battle, it is the "ideal" spot to be shot). Good shell diversity (somewhat meaningless since it is recommended to fill it with APHE). Exposed and cramped gun crew that can be destroyed with machine gun fire, or a HE shell somewhere in the rear. Rather tall profile due to gun placement. Poor gun depression of -2°. 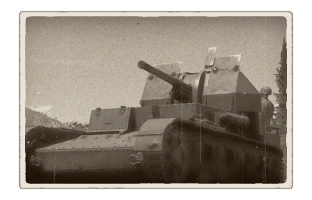 weak front armour (machine guns can penetrate this vehicle). Somewhat low shell speeds means it's hard to land a shot on a moving target. This page was last edited on 2 March 2019, at 17:22.